With the recent completion of the Han Show Theater, Stufish Entertainment Architects has brought to life an enormous state-of-the-art complex bearing a striking resemblance to the traditional Chinese paper lantern. 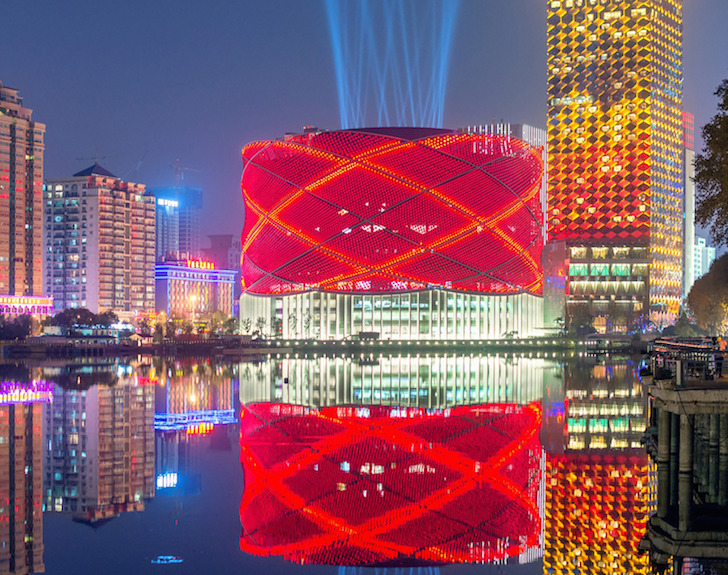 At night, circular arrays of red LEDs light up the theater facade, turning it into an eye-catching and iconic Chinese symbol of luck and prosperity. Nicknamed “The Red Lantern,” the 2,000-seat theater in Wuhan was built to house the Franco Dragone-directed acrobatic water show, Han Show. Situated on Wuhan’s Donghu Lake, the Han Show Theater was created as part of a larger cultural district development project that will establish a series of luxury, mixed-use buildings along the city’s main waterways. The theater facade was made from minimal surface cable nets and eight intersecting tubular steel rings meant to emanate a traditional paper lantern’s bamboo structure. The building is transformed into a brilliant light show at night via 18,000 red LED bulbs, which are part of a lighting system that can also host video images. Slender support columns at the base of the building mimic the tassels of a lantern. The opulent interior is decked out in a gold color palette, while natural light pours through the building’s many windows. The performance space boasts a 33-foot-deep, 2.65-million-gallon pool, moveable auditorium seats, and three moveable LED screens designed to be the largest in the world. The design was completed late December, just in time to ring in the New Year. Situated on Wuhan’s Donghu Lake, the Han Show Theater was created as part of a larger cultural district development project that will establish a series of luxury, mixed-use buildings along the city’s main waterways. The theater façade was made from minimal surface cable nets and eight intersecting tubular steel rings in reference to a traditional paper lantern’s bamboo structure. Slender support columns at the base of the building mimic the tassels of a lantern. The opulent interior is decked out in a gold color palette, while natural light pours through the building’s many windows. 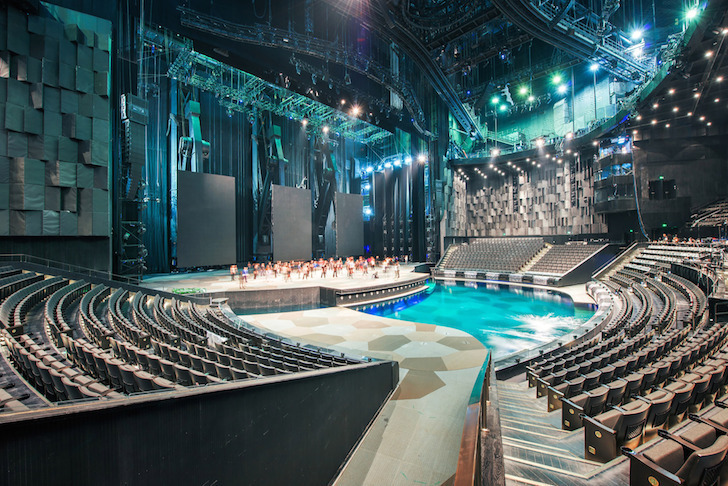 The performance space boasts a 10-meter-deep, 10-million-liter pool, moveable auditorium seats, and three moveable LED screens that were designed to be the largest in the world.